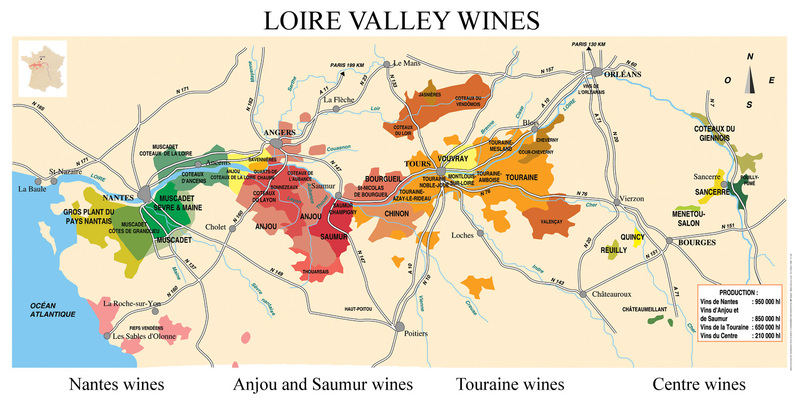 Reuilly is one of these little-known Loire appellations gravitating in the orbit of of their more famous neighbor, Sancerre. Reuilly is probably the least-known among these tiny wine regions, the other being Pouilly-Fumé, Menetou-Salon, Quincy and Coteaux du Giennois (this latter one is maybe even more obscure to most consumers). If you want to know more about this AOC, I strongly recommend that you read Richard Kelley's Reuilly page where you'll find the most extensive information you can dream of about the region. The surface of the planted vineyards in Reuilly is small, about 185 hectares, but the total potential surface (the one that can qualify for appellation plantings) is 600 hectares, and looking around, you see indeed more other crops than vines on the light slopes of the area compared with other wine regions. The Reuilly area sits on two départements, the Indre (#36 on license plates) and the Cher (#18), with the Arnon flowing in between, this quiet river flowing into the Cher river north from here near Vierzon. The AOC was created in 1937 but the region has been making wine since the Middle Ages, from Sauvignon and Gamay from what I understand. While Reuilly is a small sleepy town with yet some commercial activity (picture on left), Lazenay is a quiet village 3 kilometers from there (pic on right) on the eastern side of the Arnon. The region is known as having a more continental type of weather, which includes drier summers, and riding on my motorbike from the region of Saint-Aignan (further west) that weekend, I noticed that the drought endured in 2012 all over France was here more severe than in Touraine, the grass looking completely dry as if we were in southern France. The varieties grown in Reuilly today are Sauvignon, Pinot Noir and Pinot Gris. The rosé wine (or gris) made from Pinot Gris is what makes Reuilly stand out, particularly when it's made by Jacques Vincent who for years has been a reference for it in-and-outside Reuilly, his rosé being repeatedly listed in the Guide Hachette and medalled in other wine institutions. Pierre and Jacques Vincent To reach Lazenay from Reuilly, you take the road across the Arnon (pictured on right), then you turn on the 1st road on the right and Lazenay is only a couple of minutes away. Jacques Vincent's winery is a bland white building built next to his house on the outskirts of the village along a field. Jacques is now helped by his son Pierre, who like his father has also learned the trade on the job but also got a training degree at a wine school. There are 3 family wineries in the village, to compare with a total of 40 wineries working on the Reuilly appellation. Jacques Vincent's wine range is very simple : a white, a red and a rosé. He works on 9 hectares, his three varieties being grouped in a single block on a terroir named Les Lignis, a short drive from the facility. He sells most of his wines (80 %) direct at the winery to individual customers, he ships 10% and exports 10% (Japan, Holland). The Pinot Gris rosé makes up 50 % of his production, the red and the white making 25 % each. Other wineries around here have usually 50% of Sauvignon, but Jacques Vincent understood very early that the Pinot Gris was a great variety to grow here and that its rosé was unique in many regards. Jacques Vincent learnt the trade on the job like many vignerons, helping his parents from as early as 4 or 5, and then taking the reins of hiw own estate in adulthood. He officially set up his winery in 1976, he didn't use the parcels of his father which were scattered in different places and were often complanted, meaning you had to make successive pickings and sort the varieties one by one at harvest. So, he chose to plant a large block elsewhere, each variety clearly by its own, and not scattered so that he could conveniently move from one plot to another. The inter-row makes 1,4 m with a distance between the vines of 1 or 1,2 m, depending of the parcel. Jacques Vincent near his fiber-glass vats In the early years, Jacques Vincent vinified his wines in these resin vats equipped with floating lids, in a low-ceiling vatroom. He later bought a line of large stainless-steel fermenters complete with temperature control, and the fiber-glass vats were from then on used for wine storage only. He has enough capacity for 3 harvests, he says, as he makes 450/500 hectoliters on his 9 hectares, but he has no plans to augment his surface for now. For the bottling they joined a CUMA, a group of several wineries owning and maintaining tools in common to share the costs, some investments being too big for a small winery. the CUMA system is very pertinent in the sense that it helps farmers and growers reduce the costs and it is a good alternative to own big machinery. They're making tries with a couple of casks of Pinot Noir, it's still a small volume but there are customers for this wine. When he was a teenager, at 17 or 18, this was around the 1950s', he remembers having vinified Gamay in old barrels, and the wine was excellent. Remnants of Gamay were still found around here but the normative AOC soon made them obsolete commercially. He says that these were Gamay Fréaux, by the way, not ordinary Gamay, they were very dark in color. Jacques Vincent toasting with friend Jean-Claude I'm probably lucky because as we were chatting in the tasting room in the beginning of my visit, a friend of Jacques dropped by inadvertedly, this was Jean-Claude, a long-time friend who also used to give a hand at the harvest here at the winery. This was the occasion for the two buddies to remember a few anecdotes which will help understand a few important issues. Jean-Claude is now the mayor of a neighboring village. __ Reuilly Jacques Vincent Sauvignon 2011. Very floral nose. The wine has a light bitterness in the end of the mouth which he relates to the particular minerality of the soil (sand, gravel and pink/white quartz). Bottled in early february, like the two other wines by the way. There's no élevage here. The fermentation is conducted through addition of selected yeasts. Jacques Vincent says that he is looking for nice, neat fermentations which don't last too long and finish the sugar. He says he is not using yeasts aiming at specific aromas, because if the wine has not already the right aromatic potential, this will not help much. He says that his yields are about 50 hectoliters/hectare, just the right volume for a good profitability within the quality window. This cuvée makes a total volume of 100 hectoliters. __ Reuilly Jacques Vincent Pinot Gris (rosé). This is the wine my friend-sommelier Alain Segelle told me not to miss. I'll ask him if I can download and link-to his lyrical tasting notes, they're in French but if you understand it more or less you'll salivate and year for the real thing... The nose is almost stony, Jacques says that the soil is similar to the one of the Sauvignon. The wine has a gentle balance, it's aromatic and, Jacques adds, it ages well. There's also this light bitterness which adds to the overall charm of this rosé. Jacques Vincent planted these vineyards himself, so the vines aren't very old, 25 years at most depending of the rows. When he capitalized on the Pinot Gris at the beginning, he wasn't followed, the other vignerons sort of preferred to stay on the secure grounds of Sauvignon, but his tenacity proved successful in the large following this rosé got among his customers. Asked if he'd like to augment his surface by buying more vineyard, Jacques Vincent says that there is no vineyard for sale in Reuilly but there's the alternative to plant new surface. He doesn't to in the near future though. Jacques Vincent doesn't use the same yeasts here, although 20 years ago he would the same lab yeast than for the Sauvignon. __ Reuilly Jacques Vincent red (Pinot Noir) 2011. From a 2,5-hectare vineyard. Expressive nose, the color is relatively light. Like the other wines, sulfur is added on the incoming grapes and more later during the vinification depending of the lab data. He says that there is about 30 mg free SO2 at bottling and 80 to 90 total SO2. The other wines have a bit more SO2 but it's more or less the same level. This wine is filtered. __ Reuilly Jacques Vincent rouge 2010 (Pinot Noir), vieilli en fût de chêne (aged in oak casks). The color is lighter than the non-oak Pinot Noir. Lightly toasted aroma on the nose. Pleasant wine in the mouth, the oak being in the back seat. Pierre Vincent with the vineyard tractor Asked about what type of vineyard management he follows, if it's organic or something like that, he says strongly no, adding something that reminded what wine critic Michel Bettane once said : "organic wine doesn't exist", except that here it was rather "organic farming doesn't exist". He says that he sprays when necessary (with systemic products), he also mowes the grass between the rows and he sprays weedkillers under the vines to keep grass permanently off the root. He may scrap the upper soil on certain years if he feels it better than weedkillers. This year wasn't a year where grass was a major problem because of this harsh drought. He also adds fertilizers at the end of winter or early spring, saying that otherwise the vines will not fare well. They're a combination of nitrogen, phosphorous, potash and magnesium. He also had lots of bark debris brought on the vineyard between the rows years ago, about 400 m3 per hectare, in order to prevent grass from growing and also keep the soil from drying too much in summer. He says this helped a lot. Back on this issue of organic farming which touched a nerve, he exclaimed that for example in 2012 with these particular weather conditions, he made 6 sprayings in total on his vineyard while his neighbor who farms organic performed 17 sprayings [I guess sulfur and Bordeaux mix, meaning copper], and he asks, "who farms the most organic ??". I looked later at the over-the-row tractor (enjambeur) and Pierre explained to me how this machine can perform three tasks in a single go : trim the vines with a moveable tool fixed on the front, while under the tractor two thin metal pipes spray weedkillers under the vines and two hanging mowers cut the grass between the row (picture on left). He shows me also how the leaf-remover tool works (pic on right), that's very sophisticated and thanks to this effeuilleuse (the French name of the tool), the grapes will get a better ventilation on the shadowed side of the row. Pierre Vincent as said above is gradually taking his marks in the winery. Jacques, his father, says that he'd like to grow in surface but he will see later. Jacques Vincent in parcel of Pinot Gris As we were enjoying the wines with Jacques Vincent, his son Pierre and friend Jean-Claude, stories from a few years ago were told, among which some about these hard__ if fun__ harvest days. Jean-Claude dropped at the winery to purchase a case of rosé for one of his friends, and as i asked if he still came to help for the picking, he says no, they're not harvesting by hand anymore, it's all machine harvested, but he used to take part to the picking, until the winery's vineyard was raided by a surprise check of the MSA some 18 years ago. For those who are not familiar with the how and whys of the French system, the MSA (for Mutualité Sociale Agricole) is the compulsory health and welfare-coverage system to which all farmers and their employees must comply and register. THe MSA runs surprise checks on the fields and in the farms, sometimes accompanied by Gendarmerie police, to check if all workers are documented and have been declared beforehand. Even if a picker is legally allowed to work in France, he must have been registered at the MSA, and that's what this administration wants to check. Picking work had been left free of enforced regulation for ages, growers routinely say that such checks would have been unthinkable in the 60s' or 70s' but in the 1990s' some bright mind in the administration thought that repressing this 15-day seasonal work would bring more money in the system, and of course that brought just the opposite in the sense that this seasonal employment dwindled sharply. When this surprise MSA check happened during a harvest some 17 or 18 years ago, some of the pickers were regular employees but others, like Jean-Claude were friends or family members giving a help, like it has always been in this trade. Jacques Vincent was furious and told the MSA guys that he would stop using ANY pickers altogether and he would buy a harvesting machine for the next season. The MSA people begged him no to do that but with the uncertainty of the pending penalty or fine following this check and the risk of more harvest policing in the future, Jacques Vincent bought indeed a harvesting machine for the following harvest. He was never fined actually for this infringement but the climate of fear instigated by the MSA was enough to terminate a long and innocent tradition of hand pickings. The Sauvignon block, bordered by woods Jacques Vincent adapted quicky to the machine harvester, but he said that these pickings by hand were fun and the opportunity to do something together with friends. They were about 50 pickers back then, most non-professionnals, people who had a job elsewhere but were pleased to take part. Jacques has another anecdote on this issue : one of his employees was also raided one winter 2 years ago as he was pruning alone in the vineyard, and for this surprise check there were 3 gendarmes (police) in addition to 2 MSA guys, lots of people for a single worker pruning his vines... My guess is that the MSA is wary of farmers who could freak out and burst into unpredictable violence. It happened several times that farmers fed up with the administration harassment and threats on their livehood attack the MSA inspectors, like in this story (in French) in Champagne or in this other story (in French) where a farmer shot dead two inspectors including one from the MSA during a surprise check. Jacques says that these administration checks are a crazy waste. While looking at the Sauvignon part of the block, we tasted a couple of grapes from the lower canopy, the one that I tasted was savourous and generous in taste, looks like if small in volume, the wine should be good after the sorting of the green overload. Green grapes along with ripe grapes This vintage will have been very difficult in many regards because of the weather conditions and the drought. The difficult issue will be to sort the grapes which have different ripeness and maturity on the same vine. Here for example you can see what has been typically happening this year : the ripe grapes (here, Pinot Noir if I remember) are hanging in small, meager clusters on the lower part of the vine while a large and unplanned quantity of new, green grapes have blossomed at the top of the canopy. He says that the vine has sort of compensated the lack of grapes and grown another load of untimed clusters which are way behind in maturity compared to the regular ones [see on the left a close-up on the green grapes that also appeared on the top of the Pinot-Gris vines]. They will be of no use when the harvest takes place in about 2 weeks and Jacques Vincent says that they will have to cut them down by hand before the machine harvest. He says that he has never seen such conditions, the closest catastrophic vintage being 1991. This year will have extremely yields indeed, he says, that's very rare to go through such difficult vintages. This year the yields on the Pinot Noir will be 15 to 20 hectoliters/hectare. While we drive on the grass lanes between the plots and stop in a few parcels to watch the rows and vines, Jacques Laurent shows me an old shack which was used in the past for the workers, there was enough room to take shelter from the rain and store tools or a few posts, and under a wooden plank on the ground there is even a water reserve for the horse. He showed me inside, the water was still there if downright brackish. Amazing. Speaking of the Pinot Noir, he says that he tends to limit his yields to 45/50 ho/ha in order to get quality wines. The allowed limit is 57 or 60 ho/ha on Reuilly but he says that this is too high for a quality Pinot Noir. To achieve the desired yields, he prunes rather long and in april/may he thins out the shoots every other eye. Green harvest is useless, he says, it's too late to try curb the yields at that stage, the vine has already done its work. To do this pruning and ébourgeonnage, they can't hire a third party, it's too sensitive a job, so they do it themselves. Small is beautiful Watch out for the vintage 2012, the yields will be ridiculous but the quality might surprise us. This cluster of Pinot Noir epitomizes the situation, small-sized cluster with missing grapes, but the few grapes that will make it should be excellent. The arduous job will be to walk between the rows before the harvest and take down all the green grapes. The nose is impressively aromatic for its age, with notes of honey, white flowers, Jacques says some liquorice and prune. The mouth is round, rich and well structured. Nice palate feel, and Jacques says it can wait more years... Thank you Jacques ! Read and watch on Ophélie's blog Miss Glouglou about Jacques Vincent, especially the second video where Jacques says (in French of course) that it's time to leave France and go make wine elsewhere because of the constant hassles and ever-increasing taxes imposed by the administration and the lawmakers. He also speaks about an anti-alcohol law that was close to pass recently and which was supposed to make free tastings in wineries illegal. He says in substance that there's a permanent uncertainty in France because of the relentless anti-business moves and because of that, you can't plan for tomorrow.